People say that when you’re given something for free, it doesn’t mean as much to you as something you work hard to earn. While there’s certainly some truth to that theory, there are exceptions. For example, if your grandfather gave you a valuable family heirloom, you’d probably treasure the gift, even though you did nothing to earn it. The same goes for eternal life. The salvation that leads to eternal life is a gift. We can do nothing to earn it; all we can do is accept it. That doesn’t mean it was free, though. Our eternal life cost Jesus his earthly life. He gave himself to save us because no one else could. Our sin required a perfect sacrifice, and he’s the only perfect person who ever lived. 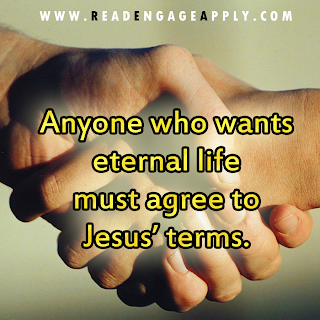 That’s why eternal life comes through Jesus and Jesus alone. Jesus is the resurrection and the life because death could not conquer him. Anyone who wants eternal life must agree to Jesus’ terms. But that’s good news because all he asks is that we believe in his power—and his power alone—to save us. Dear God, thank you for sacrificing your Son for us. We put our faith in him alone to save us from sin and give us eternal life. Amen. Don't Feel Close to God?